The other day I was at the grocery store looking for dips, and they all seemed so unhealthy. Many dips have MSG and other ingredients that are not good for you. When I got home, I decided to make my own with my Magic Bullet! This carrot, turmeric yogurt dip is packed with flavor and great for dipping vegetables. Add all ingredients to a Magic Bullet cup and blend. It is no secret how much I love galettes. They are super easy to make, especially when you cheat a little bit with a store-bought crust. They don’t need to look pretty, and they taste great with just about any ingredient. For this galette recipe, I used herbed goat cheese and sour cream as the base, topped with cooked, sliced beets, honey and baby kale. For a crispier crust, you can brush an egg wash all around the edges just before baking. Add the cheese, sour cream, herbs and pepper to a Magic Bullet cup and blend until smooth. Roll out a thawed pie crust to about 12 inches, then spread the cheese mixture on top in the middle, leaving 2-3 inches on the sides. Place the sliced beets on top of the cheese mixture and drizzle honey on the top, then fold the crust up around it. Bake at 400 degrees F for 30 minutes. Smoothies are probably one of my girls favorite after school snacks. I love it because I can make all three of their snacks all at once, instead of dirtying a bunch of dishes. I also love that there is usually some left over for mama to have a snack too! Add all ingredients into the Magic Bullet Blender and blend until creamy. Serve with toasted coconut on top, optional. Salsa doesn’t last long in our household. We usually have a handful of jars of homemade salsa in our fridge and 15 opened bags of tortilla chips in the pantry. We are slightly obsessed. Tomatillos have become my new favorite salsa ingredients, especially roasted! The flavor is similar to tomatoes, but more tart. Paired with cilantro and roasted jalapeños, you might find this recipe to be your new go-to! Turn on your oven broiler to high. Add your tomatillos, jalapeño, and garlic to a baking sheet. Toss with olive oil and a sprinkle of salt. Broil until charred. Remove from the oven and add the ingredients to the Magic Bullet Blender, along with the rest of the ingredients. Seal in an airtight jar and keep in the fridge for up to 1 week. Summer weather has reached our hometown of Las Vegas and I find myself trying to get creative with sweet and healthy ways to satisfy my sweet tooth. This freeze definitely brings me back to times when I walked around crowded and super hot theme parks as a teenager, and the only thing that sounded good was a nice cold and tart lemonade freeze! I see this treat being made over and over all summer long! 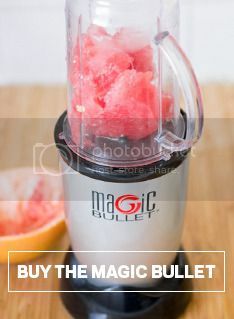 Add all ingredients to the Magic Bullet Blender. Use the larger blender for best results. Blend until it’s a smooth crushed ice consistency. You can add more water to allow it to blend easier. In my opinion, every cook needs to know how to make a basic, yet delicious, creamy mushroom sauce. So here you go! I like to used organic cremini mushrooms and find they give the sauce a great flavor. In addition to the mushrooms, you will need heavy cream, milk, thyme, and garlic. After sautéing the mushrooms and allowing them to simmer in cream for a few minutes, I like to transfer half of the mixture to a Magic Bullet cup and blend, then add back to thicken up the sauce. Heat the olive oil in a skillet and cook the mushrooms until brown and tender, about 7 minutes. Add the milk, cream, cheese, thyme and pepper and bring to a boil. Lower the heat and simmer for 5 minutes. Transfer half of the mixture to a Magic Bullet cup and blend, then add back to the skillet. Stir and cook for 2 more minutes. Pudding has become my girls FAVORITE dessert. We are always trying new recipes and creations with different toppings, but I think we all agreed that chocolate was the best. This pudding is definitely rich and decadent. But making memories with my girls while making food is one of my favorite things! In the large blender cup of the Magic Bullet Blender, add the chocolate chips, sugar, and eggs. While the blender is running, slowly add in the hot milk and then the vanilla until everything is melted and runs smooth. Pour mixture into dessert cups and refrigerate for a few hours until firm. Top with whipped cream or other desired toppings. It took me many years to perfect my favorite quiche recipe, always striving for the best texture and flavors. This is my go-to quiche recipe that turns out perfect every time. Quiche is always a nice addition to the breakfast table, but equally nice when paired with a salad for lunch or dinner. I think of baking a quiche in 3 steps: the crust (if you are making it at home), the egg filling, and the vegetables/meat/fish filling. The crust is prepared first, so later you just have to add everything in a finish baking. Next, I prepare the vegetables and/or meats/fish and lay them down on the bottom of the pie. Last, I whip up the eggs, cheese and cream in my Magic Bullet blender and pour over the top. Cook the bacon in a skillet until crisp, then add the leek and 1 tbsp olive oil and cook until tender, about 7 minutes. Crumble the bacon and fill the bottom of the crust with the leek and bacon mixture. Add the eggs, milk, sugar, salt and cheese to a Magic Bullet pitcher and blend. Pour over the quiche filling. Bake the quiche in the oven for 15 minutes, then lower the heat to 300 F and bake for 30 more minutes. Not all waffles need to be sweet. These cheddar waffles go great with chicken and gravy, or with a dollop of sour cream for a delicious savory side dish. You can experiment with other cheeses and herbs by adding them to this basic cheddar waffle recipe. Try adding fresh chives on top! Pour the batter onto the waffle maker, close and cook until crisp. I feel like every time my bananas turn brown, I create a new banana bread recipe with different variations. I wanted to try something different besides my typical chocolate chip banana bread. So, I browned some butter which gave the bread a hint of caramel flavor and then added one of my favorite spices. It’s almost like a little piece of the Fall Season in one recipe! In a bowl, mash the bananas and add them to the large blender cup of the Magic Bullet Blender. Set aside. In a sauce pan add your butter and melt on medium low heat while continually stirring until the butter has reached a light to dark brown caramel color. Remove from heat to let cool. In the blender add the eggs, sugar, yogurt, and milk, with the bananas. Blend until creamy. In a separate bowl, whisk together the flour, spices, and baking soda. Fold in the banana mixture, and then stir in the browned butter. I made 4 mini loaves, baked at 325 for 30-35 minutes. Adjust time accordingly if you are using large bread pan.